Copper pipe, as well as galvanized steel and PVC pipe, is a common pipe for plumbing purposes. 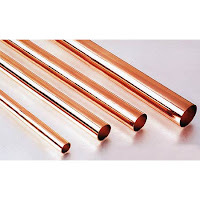 Copper pipes are very durable and are likely to last for a very long time. They are easy to work with for installation and can be very versatile to meet many of your plumbing needs. Copper pipe is typically safer in natural disasters and does not give easily weather or bacteria. It is also beneficial price-wise. Type K - The thickest walls and most frequently used for underground service lines. Type L - Used for interior hot and cold water supply. Type M - The thinnest walls, also used for interior hot and cold water supply. DWV - Used for drain-waste systems and for venting. When choosing pipes for your in home plumbing systems, copper pipes are a safe way to go. They can guarantee long-term survival and when the time comes for them to be replaced, they can be easily recycled, helping the environment! For more information on this and other types of pipe, visit our website!